NB: A Friday Forgotten Book. His Neighbor's Wife, by Peter Rabe, published in the US in paperback by Beacon Signal in 1962 (cover art uncredited). 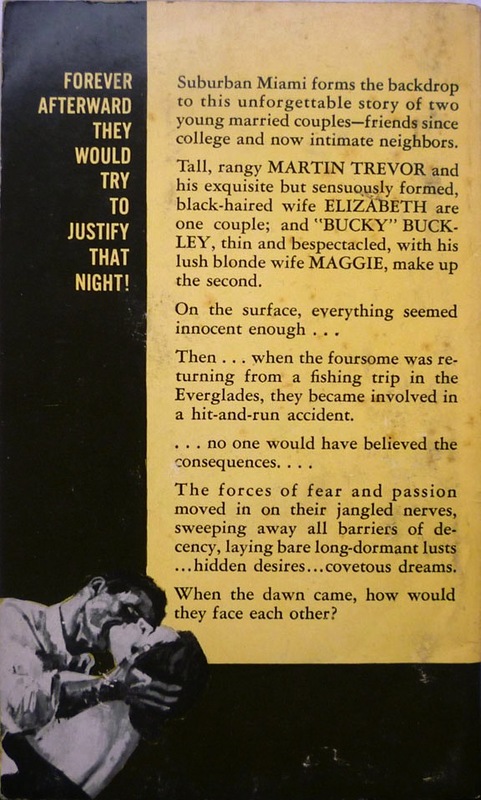 Now, this one isn't, strictly speaking, a sleaze novel; it's obviously been packaged (and possibly titled) as such by Beacon, and Rabe told George Tuttle in 1989 that he wrote it as a "quickie with pornographic overtones... when I was very short of money and simply had to knock something out". (Ooer, missus.) But it's actually more of a psychological melodrama than anything – admittedly with a bit of additional bed-hopping between the four leads, but overall not too far removed from the bulk of Rabe's crime and suspense canon. On balance, His Neighbor's Wife might well be the most collectible – which is to say, expensive – of all of Rabe's novels; of the five copies currently available on AbeBooks, the cheapest is around sixty quid (with the more expensive more like ninety), so I was pretty pleased to win my copy – from a British seller, unusually – for much less than that, and in splendid condition too. And there'll be much, much more from Peter Rabe on Existential Ennui over the next month or so, because I've a whole stack of Rabe paperback originals to unveil, all of which will be accompanied by commentary by none other than the aforementioned Donald Westlake (as a consequence, I'll be cross-posting them on The Violent World of Parker). In amongst those, I'll be spotlighting some other, non-Rabe, paperbacks I've acquired of late – and while I'm in a teaser-y frame of mind, let me just mention that on top of all that, next week (fingers crossed) I'll finally be returning to the Great Tom Ripley Reread, with the fourth novel in the Ripliad, The Boy Who Followed Ripley. Hope you can join me then. You know, one thing I've noticed about Rabe is that he was much less playful than many of the authors he influenced. He could have written his own satiric self-mocking look back at his time in the sleaze trenches, but doesn't seem like he felt any inclination to do so. Very serious guy. You got me interested in this mini-trend represented by Dresner, Block, and Westlake (there's a law firm for ya), each of whom seems to have gone in very different directions with the basic idea. But what really struck me, once I got my copy of Westlake's book, was that the American paperback reprint cover from 1971 was clearly trying to look like the paperback cover for Portnoy's Complaint--same basic design, no illustration on the cover. The covers for Ronald Rabbit and Dirty Books both featured suggestive cover art. Adios came out so shortly after Portnoy's, there's little chance the latter was any influence on the former, which was probably written before Roth's book came out. Dirty minds think alike--but differently.